The artists’ pages in Performance Research journal’s On Duration October issue present images from our performative-based art practice, which interrogates the relationship between drawing and performance to explore themes of duration, movement and the transmission of energy. 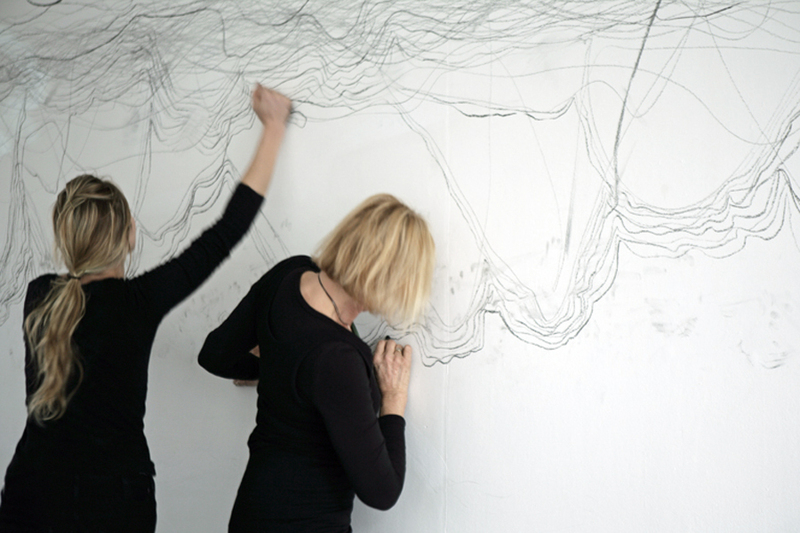 The repetitive and continuous action of mark-making in the one to two-hour performances identifies the body as a tool to stretch time and record temporal presence, while challenging how the body experiences duration through drawing. Carali and I have collaborated on drawing performances in the UK and abroad for six years, most recently the two-hour Line Dialogue 5 at the opening of the ‘Again and Again and Again’ exhibition, Vancouver Art Gallery, Canada (view also Again and Again post).